Although the Southern Cross Bar and Restaurant has meaty stone grills and a roast dinner on Sundays and Wednesdays, their strength is the ever-increasing range of interesting vegetarian, gluten-free and vegan offerings (and the fabulous sun-drenched beer garden in summer). On my most recent visit I had a Buddha Bowl of roasted spiced carrot and mint, wild rice and cranberry pilaf, toasted chickpeas (was a little wary about that component when ordering), spinach leaves, and a creamy almond dressing. It could have been up-scaled with Zany Zeus halloumi, chilli soy tofu, garlic chilli prawns or spiced chicken, but I decided I’d go for the basic and see what I thought. It really was excellent. The almond sauce was a nice conductor, and the toasted chickpeas were deliciously textured and light (not the dry dusty journey I’d expected). 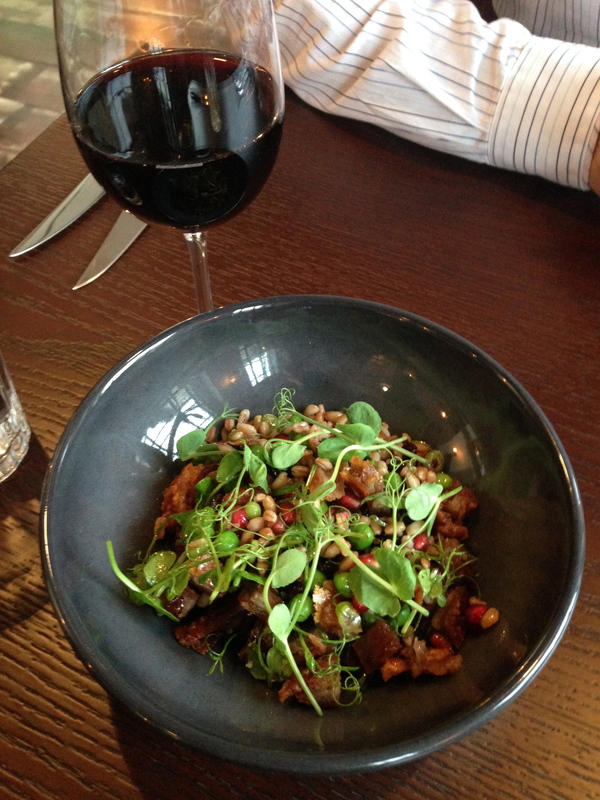 After sampling all the components, I ended up combining the the dish into a delicious mixed salad. Satisfying and healthy, nice. I noticed they have quite the cake cabinet too now (if you don’t eat your chickpeas, you can’t have pudding! ), so its also an easy place to slide by for a coffee and cake. Especially on peaceful weekdays. With at least two vegan options available always. The Cross is all about different nooks and crannies, casual and easy dining, and suitable for everyone from families to students to lunch-time workers dashing in and out, a weekend BBQ in the sunny courtyard, or a large event. And excellent for those with vegetarian/vegan/gluten-free requirements. I could go on and on….. I also might or might not have checked out the salted caramel cheesecake on a previous occasion. Somewhere along the line I’ve lost the side picture which shows that this beauty stood about 2 inches high, but you’ll get the idea. Rich, moorish and very memorable. My advice – share with a friend. And do have a look at their Wellington on a Plate offerings too, again interesting vegetarian and vegan. 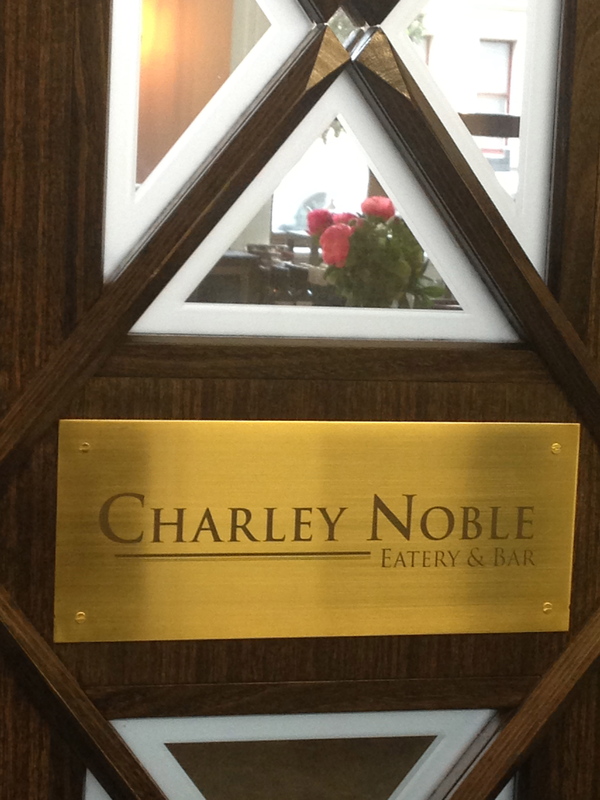 NOTE: Charley Noble now have a full separate gluten-free menu, just ask for it when dining. So the new Whitehouse venture in town is launched – Charley Noble. And a great addition to this corporate/Queens Wharf end of town it is. A bar and restaurant focused around wood fired cooking (wood fired rotisserie 1/2 chicken, fire grilled vegetables, wood fired lamb shoulder anyone?) and fresh seafood (esp if you’re an oyster lover), delivering a quality experience at comparable prices to many other places around, and with a vibe a little like a cross between Matterhorn and Pravda to me. 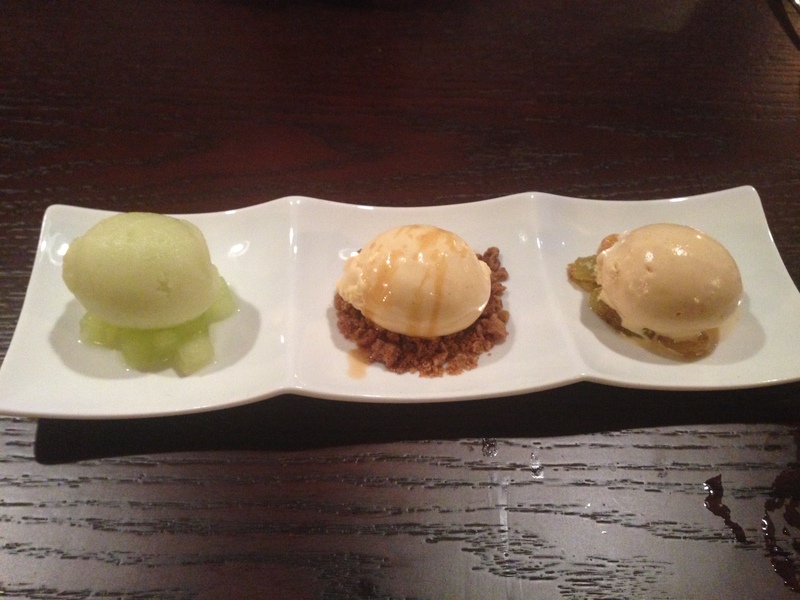 Although they market CN as more ‘accessible’ it still retains that finer edge in quality and presentation (like the ice creams inspired by apple pie, with each presented on a bed of green apple, or crunchy crumble or fat golden raisins as relevant to the flavour – and so pretty!). All the dishes we tried were all very flavourful and well put together. No salt and pepper on the tables and none offered (not that I use either, but interesting that there appears to be a clear decision to stand by their flavourings as delivered). The toilets being a bit of a hike down the corridor and around the corner from the restaurant (and potentially hard to keep up to the standard of the restaurant). Having to chase my Israeli couscous (beneath that delish wood fired lamb shoulder) around a pudding bowl with a fork and knife, harder to scoop up than you’d imagine! 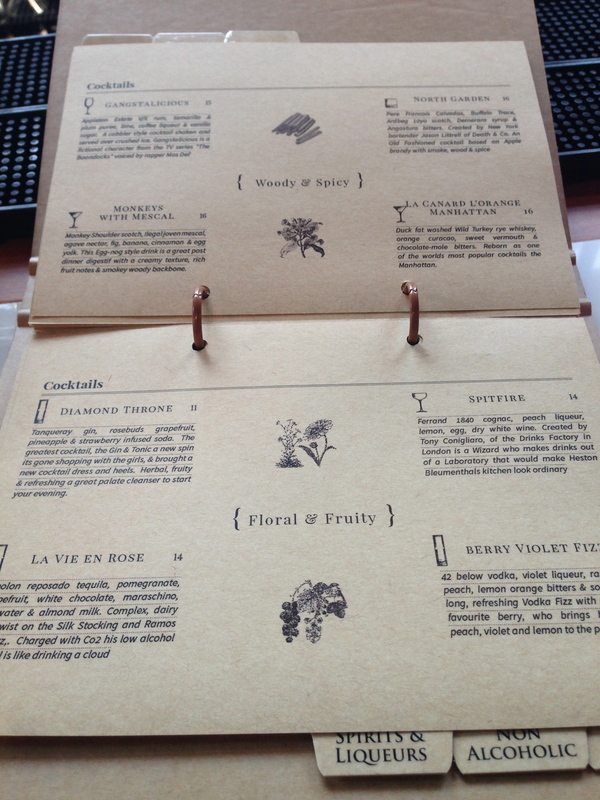 You could easily come here just for a drink and nibble, small plates or full on dinner. They are currently doing Monday to Saturday 11am til late, and plan to open for breakfast from 9am in the not too far off future. Definitely worth a visit (or two). Ground Floor, Huddart Parker Building, the corner of Customhouse Quay and Post Office Square (directly opposite The City and Sea Museum at Queens Wharf).